SL-NTFS (Snow Leopard NTFS) is a Preference Pane that enables writing on NTFS (commonly used by Windows XP/Vista/7) formatted disks. Mac OS X prior to Snow Leopard could read NTFS disks/partitions, but couldn't write to them. Snow Leopard has the ability to write to NTFS, but because Apple does not officially support it, this capability is disabled by default. Because SL-NTFS is basically an interface for configuring the Apple NTFS driver, any issues you might encounter will be related to the Apple driver rather than SL-NTFS. If you require a more robust, supported solution for writing to NTFS drives/partitions, I recommend you locate a more comprehensive solution. SL-NTFS shouldn't be used in conjunction for any other solution that provides the same or similar functionality as this will likely cause you some trouble ! Installation : Installation is very simple. 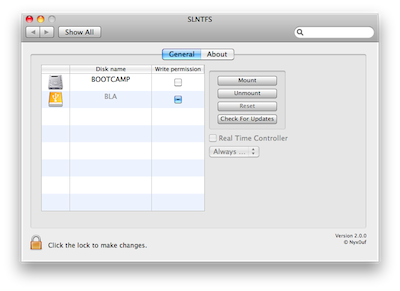 Download and unzip the SL-NTFS archive, launch the installer package and follow the install procedure as prompted. Add Italian & Spanish localizations.